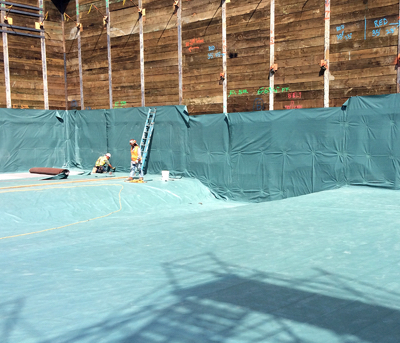 Waterproofing systems are also the unsung heroes of construction. The second that water, harmful gas or contaminated vapor infiltrate a foundation, a building may become worthless without effective, below-grade building envelope protection. Planning such protection is always a challenge, and site conditions can arise that exponentially increase complexity. In the following situation, a team must make an extra-collaborative effort to produce a solution that will keep the building and its occupants dry and safe. The 1840 N. Highland Ave apartments project in Los Angeles is an excellent example of how a sophisticated, well-designed waterproofing system can make the seemingly impossible entirely possible. The facility is high-profile and well situated - just steps from the Hollywood Bowl and Hollywood Boulevard. The building lot was zoned for a multi-unit housing project; however, the Alquist-Priolo Earthquake Fault Zone runs through the property boundaries. This created some interesting challenges for the team. To protect the structure from seismic activity - should it occur - the team decided to install a 2-foot-thick layer of Geofoam fill between the shoring system and below-grade shotcrete walls, which had been put in place to reduce or eliminate the impact of seismic movement on the building's structure. Three stories of the structure sit below grade, so groundwater infiltration was a major concern. The fact that the foundation was also in the water table meant some major problem-solving had to take place. "There were some real twists to the project, including two fault lines under the cantilever of the building and the water table, which sat at different levels," said Josh Heidt, CP, Terra-Petra, who was contracted to provide waterproofing consulting services. "The building owner and general contractor were not thrilled; they didn't want one drop of water entering the building, as there was the issue of bulk water entering." First, to ensure quality and confidence in the work, the team chose protective products from a well-established manufacturer of waterproofing and contaminant barrier systems. Offering below-grade systems for underslab, wall, and shoring-wall applications, as well as deck applications, EPRO Inc. was selected as a single-source provider for the entire building. The company is known for providing effective, long-term, warranted protection for buildings and their occupants against the hazards of water and contaminant intrusion into buildings. It pioneered redundant field-installed composite design, a method requiring that systems be fabricated in the field - not in the factory - using multiple and redundant protective materials. 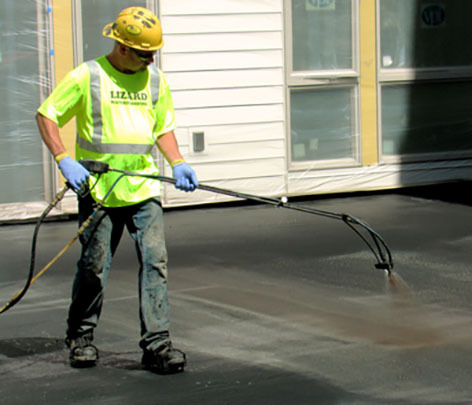 This redundancy is achieved by combining different types of waterproofing materials to leverage the positive attributes of each and eliminate a continuous seam. Within each application category, EPRO offers a good (E.Proformance), better (E.Protect), and best (E.Protect+) system, allowing for cost-efficient condition matching between system and site. 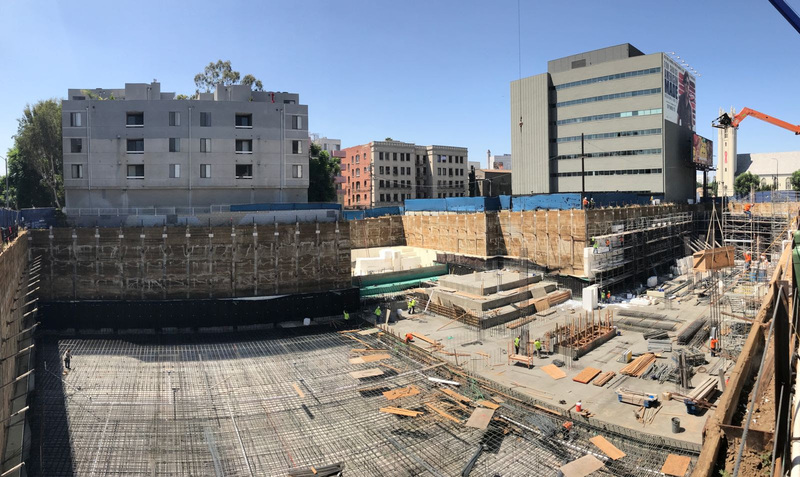 For the 1840 N. Highland Ave. project, the team determined that E.Protect+ Underslab was the best solution to protect the building foundation and blindside vertical walls for water intrusion considerations. Above the design water table, E.Protect+ transitioned to the E.Proformance Shoring system. 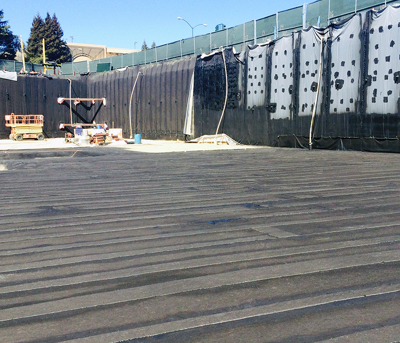 Complexity increased as EPRO's negative-side waterproofing systems were applied directly to the Geofoam layers for below-grade waterproofing purposes. The transition between E.Protect+ (hydrostatic) and E.Proformance (non-hydrostatic) was at 2 feet, 0 inches above the high historical water table level and extended to grade. "EPRO helped us and the geotechnical consultant work through the issue regarding the north face of the building where the fault line divided the water table across the north and south sides," said architect Ronald Rosell, AIA, with the project architect, Arquitectonica. 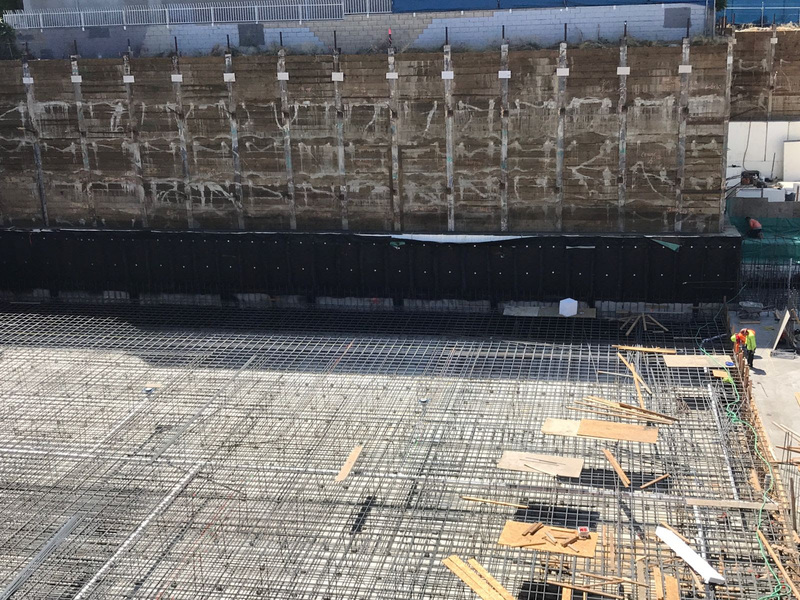 "The fault acted like a subterranean waterfall, and EPRO gave us recommendations for how best to prevent that hydrostatic pressure and constant flow of water from impacting the structure." The waterproofing system was also carefully detailed around many pipe penetrations and several pits for both elevators and utilities. 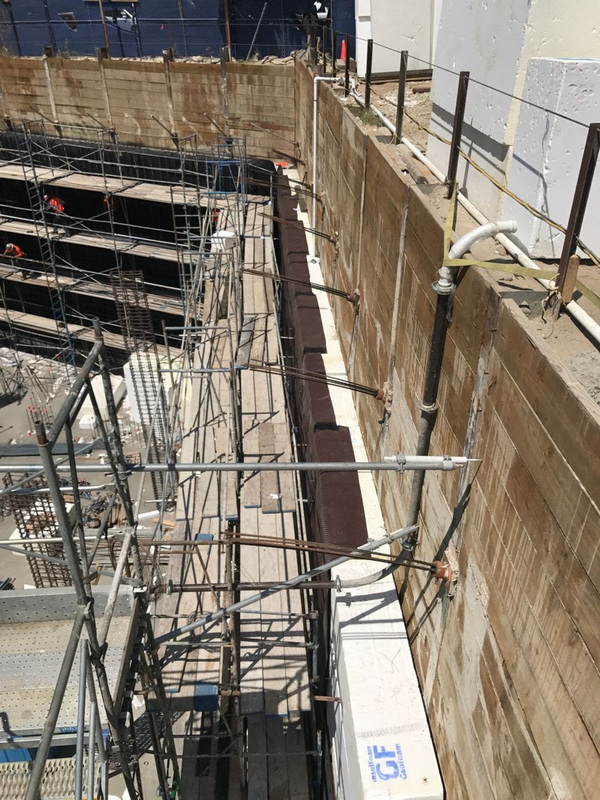 In addition to using E.Proformance Shoring for the non-hydrostatic waterproofing system, the team selected it as a solution for treatment at grade level, where it was transitioned to a hot rubber horizontal waterproofing system, a landscaping area for planters and a stucco wall system. The project team included general contractor Frymer Construction, architect Arquitectonica, waterproofing consultant Terra-Petra, EPRO and certified EPRO applicator BMG. All parties shared their expertise and insight to determine an effective solution to a unique problem. The 1840 N. Highland Ave. apartments are expected to be complete in 2019.